Sweet African honeybush appears to be MADE for tropical flavors. Combine it with dried pineapple, unsweetened coconut flakes and a touch of rum flavor, and you’ve got a tea so soothing, relaxing and pleasing to the senses, that, like I wrote on the label, you ought to be required to sip it from a hammock on the beach. I’ve got to be honest; I wasn’t very interested in trying this tea when I first saw it on the 52Teas website. I’m not a big fan of piña coladas. (Although I do like the tune – catchy!) However, I had read so many positive reviews of it on Steepster that I just had to give it a try. Fortunately, 52Teas sells their teas in 2 ounce packages – not a big investment to try something you’re not too confident about. But really, I don’t know what I was so worried about! This is 52Teas, after all, one of my favorite online tea companies. I have yet to try a tea from them that I really dislike. My curiosity got the better of me and I finally decided to buy a package. And WOW! This tastes fantastic! 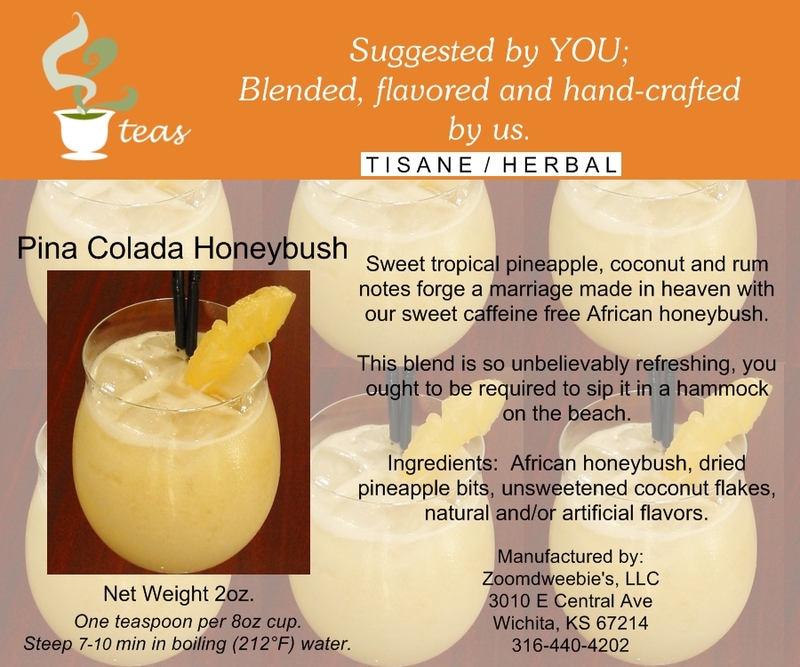 I’ve tried a few piña colada flavored teas, and with most that I’ve tried, the flavors of the coconut and pineapple are represented but there is seldom anything resembling rum in the blend. Not so in this blend. There is a touch of rum flavoring to this. It isn’t an overwhelming flavor, but just enough to make this taste more like a piña colada than a tropical flavored tea. The coconut and pineapple flavors add a pleasant sweetness and tropical flair to the cup – maybe I should be drinking this out of fancy stemware rather than my tea mug – complete with a little paper umbrella! But as delicious as this tisane is hot, it is even better iced! It is super refreshing and fast becoming one of my favorite cold drinks – I could drink it all day! That is… if I hadn’t just used the last of my package. This is definitely a must try tea!